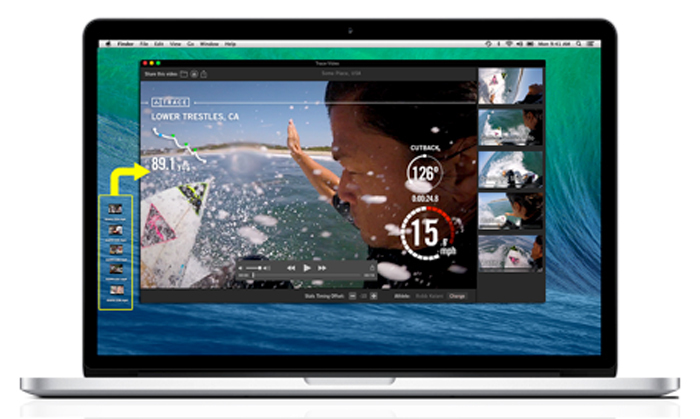 Take the hassle out of video editing with Trace Video, the desktop app for Mac that automatically edits ski, snowboard and surf footage by using performance-generated metrics to separate the action from the mundane moments. Simply drag raw files into the Trace Video app and Trace will clip the highlights, color-correct the footage by adding contrast, speed and stability and overlay statistics including momentum, distance and location. Prior to filming, sync Trace to any Wi-Fi connectable camera and Trace Video will automatically color-correct the footage with enhanced lighting, timing and stability. By overlaying stats such as speed, distance and time, users are able to see their results and measure their performance. Within seconds of processing, Trace Video saves clips its user’s hard drive, or allows the footage to be shared on social media with the simple tap of a button. Trace Video has already created more than 14,000 edits to date and is the only auto-editing software trusted by top competitors including professional surfers Jordy Smith and Kalani Robb and Freeskiing Olympic Gold Medalist, Joss Christensen. For athletes, video is one of the most essential tools for improvement. 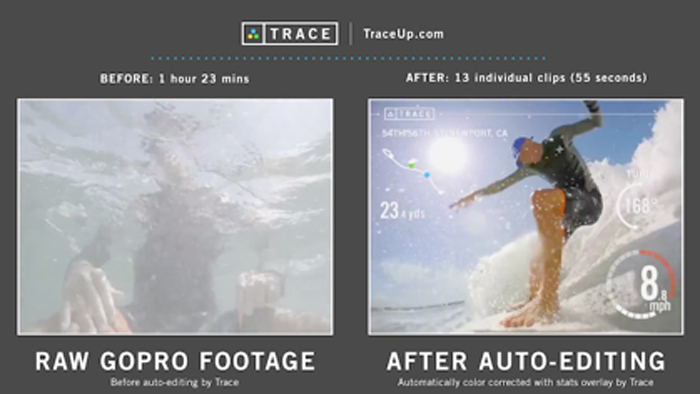 Trace Video allows athletes to spend less time editing and more time reviewing footage in order to progress. In addition to its auto-editing features, Trace accurately measures GPS, calories burned, airtime, distance height, number of airs, number of runs and more. For surfers, Trace will measure number of waves, length of ride, number of turns, turn degree, turn roll angle, distance paddled and time. For ski, it highlights vertical, distance, slope time, chairlift time and rest time.